The Post Modern Pulp Blog: The Rat Bastards Series is Now on the Kindle! Len told me that his agent got these books into digital form, as well as some westerns he wrote. He's also written up an informative and entertaining essay on the Rat Bastards and the creation of the series in response to his agent's request that he create a Rat Bastards blog, but I haven't yet heard from him if the blog has been created, the URL, etc. The essay though should appear in an upcoming issue of Paperback Fanatic. After re-reading the book as well as some of his other stuff, I became determined to talk to Levinson, but there was absolutely no contact info for him online. After some Big Brother-esque research on Google I actually found his phone number and gave him a call...a great hour-long conversation ensued. He's a great guy, and he was surprised to hear from someone...he figured all of his work had been forgotten. No way!!!! 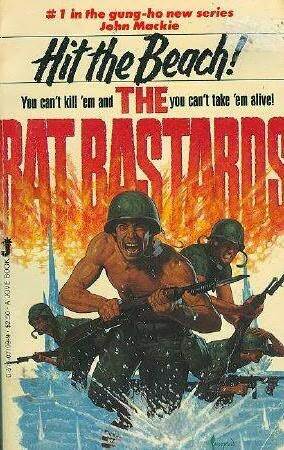 This is great news (even though I have the entire Sergeant series and much of the Ratbastards in paperback). Thanks for spresding the word, Jack. @Joe: Sounds like an interesting read. I'm glad Levinson has made this move, and I really hope as time goes on, more authors (those who are still alive and kicking) will make the effort to get their works digitized. As this blog, your blog, Hank's blog...hell a lot of blogs show, there is still a HUGE amount of interest in these works. @Hank: I'm glad I found TRB #1 in paperback for collecting value, but frankly, my place is chock-full of books, and I seriously debate with myself every time I make a paperback purchase these days. Digital might not have the soul of paper, but it's damn handy. I've never read this series but just bought the first, thanks to your post. Can't wait to wade in. I couldn't agree more, Jack. Men's adventure novels old and new are ideal for the ebook format. It's a good time to be a reader. Nice to see these back in print. I always loved the title! I just put up a new post advertizing this, Facebooked it, and Tweeted the hell out of it!